This data set is a compilation of carbon and energy eddy covariance flux, meteorology, radiation, canopy temperature, humidity, and CO2 profiles and soil moisture and temperature profile data that were collected at nine towers across the Brazilian Amazon. Independent investigators provided the data from a variety of flux tower projects over the period 1999 thru 2006. The data have been harmonized across projects, additional quality control checks were performed, and the data were aggregated to several time intervals. Refer to the companion file SITE_DESCRIPTIONS_INVESTIGATORS.pdf for the list of investigators and contact information. Two versions of data are provided. One version is as received from the investigators and the second was processed through a series of automated and manual quality control steps. The companion file CD32_QAQC_Brasilflux_network.pdf provides the quality control procedures. This data set includes 18 compressed (*.zip) data files with the two versions of data files for each of the nine sites. Figure 1. Santarem km 77 eddy flux and micrometeorological measurement pasture site (Fitzjarrold and Sakai, 2010). Figure 2. The Pará Western (Santarém) - km 67, Primary Forest Tower (Hutyra et al., 2008). The investigators were Saleska, Scott R.; Rocha, Humberto Ribeiro da; Artaxo, Paulo Eduardo; Huete, Alfredo R.; Nobre, Antonio Donato; Parker, Geoffrey; Ratana, Piyachat; Restrepo-Coupe, Natalia; Shimabukuro, Monica Takako; Shimabukuro, Yosio Edemir and Tannus, Rafael Nora. You may contact Saleska, Scott R. (saleska@email.arizona.edu) and Restrepo-Coupe, Natalia (ncoupe@email.arizona.edu). This data set is a compilation of carbon and energy eddy covariance flux, meteorology, radiation, canopy temperature, humidity, and CO2 profiles, and soil moisture and temperature profile data that were collected at nine towers across the Brazilian Amazon. Independent investigators provided the data from variety of flux tower projects over the period 1999 thru 2006. The data have been harmonized across projects, additional quality control checks performed, and aggregated to several time intervals. This data set contains 18 compressed (*.zip) data files that includes two versions of data files for each of the nine sites. The two versions of the data include an original time series, and a quality-controlled (QAQC) version (refer to section 4.0). The *.zip files also have six files in .pdf format which provide graphs of selected variables (the MAN_K34 zip files do not have graphs for monthly data so there are only five .pdf's). The 18 *.zip files are named as X_XT.zip or X_XT_QAQC.zip, where X is one of the following nine study areas, XT is a tower designation, and QAQC indicates a set of quality assured data files. Example compressed file names: MAN_K34.zip and MAN_K34_QAQC.zip. When expanded, the *.zip files each contain eight comma-delimited (.csv) data files of hourly, daily, daily daytime, daily nighttime, monthly, monthly daytime, monthly nighttime, and monthly cycle data. Files are named according to the site flux tower, a temporal value, and _qaqc for quality-assured data. The *.zip files also contain files in .pdf format named as X_XT_fig_variable.pdf or X_XT_fig_variable_qaqc.pdf,. where X is one of the following nine study areas, XT is a tower designation, and qaqc indicates a set of quality assured data files. See Table 1 for a description of the variables. The .pdf's provide graphs of selected data results. The example file names provided are for the original time series. The quality-assured data files follow the same naming conventions and include _qaqc in the file names. For additional information, refer to the companion file Data_file_descriptions.pdf. Data source: Original and quality assured time series data. Data aggregation intervals: Data reported at 10:00 are from aggregating measurements between 10:00 and 11:00. Hour runs from 0 (zero) to 23. Units: Precipitation (prec) units are mm hr-1. Other variable units as averaged over the aggregation interval..e., data at 10:00 are from aggregating measurements between 10:00 and 11:00. NOTE: There are no original time series hourly files for the K77, RON_RJA, and RON_FNS sites; however, there are quality control-hourly files for those sites. Units: Precipitation (prec) units are mm hr-1 as average. Other variable units as averaged over the aggregation interval. Data aggregation intervals: For a Julian day (day), Day-time is from 6:00 to 17:00 local time. Manaus K34 nighttime set is from 7:00 to 18:00 local time. Variable set to missing if less than 8 hours of data. Data aggregation intervals: For a Julian day (day), Nighttime set is from18:00 to 5:00 local time. Manaus K34 nighttime set is from19:00 to 6:00 local time. Variable set to missing if less than 8 hours of data. Data aggregation intervals: Month. Variable set to missing if less than 7 days of data, except precipitation. Units: Precipitation (prec) units are (mm day-1) as average. Other variable units as averaged over the aggregation interval. Data aggregation intervals: Month. Daytime set is from 6:00 to 17:00 local time. Manaus K34 nighttime set is from7:00 to 18:00 local time. Variable set to missing if less than 7 days of data, except precipitation. Data aggregation intervals: Month. Nighttime set is from 18:00 to 5:00 local time. Manaus K34 nighttime set is from 19:00 to 6:00 local time. Variable set to missing if less than 7 days of data, except precipitation. Data aggregation intervals: Hourly averages per month. Julian day set as the first day of the month. Missing if less than 7 days of data. Hour runs from 0 (zero) to 23. This data product is an assimilation of eddy flux data that was independently produced and generously provided by the PIs of a variety of tower projects in the Amazon of Brazil. This integrated dataset is intended to facilitate integrative studies and data-model synthesis from a common reference point. Two versions of the data are provided: original time series and a quality controlled (QAQC) version. The QAQC version was tested for: outliers comparison between AWS and eddy sensors-- sensors at same height, wind speed (acceptable variation is two standard deviation units form the linear regression), and unresponsive sensors. Please refer to the companion file CD32_QAQC_Brasilflux_Network.pdf for a discussion on the quality control procedures. See SITE_qaqc_merge.pdf with plots to review the flagged and removed data. This data set is an assimilation of eddy flux data that was independently produced and provided by the investigators of a variety of tower projects in the Amazon of Brazil (refer to SITE_DESCRIPTIONS_INVESTIGATORS.pdf for the list of investigators and contact information). Data are provided from nine flux network towers for the period 1999 thru 2006. The data compilation, harmonization across projects, quality control checks, and aggregation to the various time intervals was performed at the University of Arizona (MATLAB R2007b code) by the LBA CD-32 eddy covariance towers and integrated database project. This data set provides the original time series, Version_1.1.b, and QAQC, Version_1.1b_qaqc, data products. The reported values were used for CO2 eddy flux at the top of the canopy (Fc) and canopy storage flux (SCO2). At RJA and Km34, SCO2 was calculated as the spatial integration of the CO2 temporal change at five different levels within the canopy (Kruijt et al., 2004). The biotic flux measured as NEE was calculated as the sum of Fc and SCO2. Fc nighttime values during low friction velocity (u*) were discarded (Saleska et al., 2003). A different u* threshold value used at each site, in general, the selection of the u* value was based on previous studies (Araujo et al., 2002; Kruijt et al., 2004; Saleska et al., 2003). At K77, NEE values were used where the nocturnal accumulation method was applied to estimate nighttime fluxes with low u* according to Sakai et al. (2003). NEE is assumed equivalent to Fc at two sites, the FNS and PDG. In order to better capture the ‘true’ gross ecosystem productivity (GEP) seasonality, if 30% of the total length of the SCO2 time series was missing, hourly SCO2 values were estimated based on a site-specific SCO2-filling method. The diel method was used at K34 and BAN (Hutyra et al., 2007). SCO2 was calculated by logarithmic and linear regressions following Iwata et al. (2005) at RJA and CAX, respectively. GEP and ecosystem respiration (Reco) were calculated and filled using a standard method implemented at the Biogeochemical Ecology Research Lab at the University of Arizona, based on previous work by Saleska et al. (2003). Reco was calculated as the average of nighttime NEE 2 days before and 2 days after the missing value (5 days). If not enough data were available in order to calculate the average (min 10 hours), we extended the window from 5 to 11 to 15 to 21 and to 31 days. GEP was calculated as GEP= -NEE -Reco. The missing data were modeled by a look up table (LUT) of mean GEP vs. photosynthetic active radiation (PAR) and time of day (HR). This LUT was calculated by a moving window of 5 days. PAR was divided into bins of 200 m-2 s-1 widths and HR was divided into 2-hour bins. Gaps inside the LUT were filled using a linear interpolation, and if extrapolation was required, the nearest neighbor method was used. This particular method may account for the differences in photosynthetic activity between morning and afternoon and the sensitivity to soil moisture, given the 11 days window. However, if not enough data were available (min 16 hours) this 11-days window was extended to 21, or 31 days. Canopy photosynthetic capacity (Pc) was calculated as the mean GEP in the fixed range PAR light interval between 725 and 875 umol m-2 s-1 (Hutyra et al., 2007). Borma, L.S., H.R. da Rocha, and O.M.R. Cabral, Atmosphere and hydrological controls of the evapotranspiration over a floodplain forest in the Bananal Island region, Amazonia., Journal of Geophysical Research - Biogeosciences, 114, G01003, doi:10.1029/2007JG000641, 2009. Hutyra, L. R., J. W. Munger, S. R. Saleska, E. Gottlieb, B. C. Daube, A. L. Dunn, D. F. Amaral, P. B. de Camargo, and S. C. Wofsy (2007), Seasonal controls on the exchange of carbon and water in an Amazonian rain forest, J. Geophys. Res., 112, G03008, doi:10.1029/2006JG000365. da Rocha, H., H.C. Freitas, R. Rosolem, R.I.N. JuÃ¡rez, R.N. Tannus, M.A. Ligo, O.M.R. Cabral, and M.A.F. Silva Dias, Measurements of CO2 exchange over a woodland savanna (Cerrado Sensu stricto) in southeast Brasil, Biota Neotropica, 2 (1), 2002. Restrepo-Coupe, N., Rocha, H.R. da, Christoffersen, B., Araujo, A.C. da, Borma, L.S., Cabral, O.M.R., Camargo, P.B. de, Cardoso, F.L., Costa, A.C.L. da, Fitzjarrald, D.R., Goulden, M.L., Hutyra, L.R., Kruijt, B., Maia, J.M.F., Malhi, Y.S., Manzi, A.O., Miller, S.D., Nobre, A.D., Randow, C. von, Sá, L.D. da A., Sakai, R.K., Tota, J., Wofsy, S.C., Zanchi, F.B., Saleska, S.R., 2013. What drives the seasonality of productivity across the Amazon basin? A cross-site analysis of eddy flux tower measurements from the Brasil flux network. Agric. For. Meteorol. 182-183, 128-144. Sakai, R.K., D.R. Fitzjarrald, O.L.L. Moraes, R.M. Staebler, O.C. Acevedo, M.J. Czikowsky, R. Silva, E. Brait, and V. Miranda, Land-use change effects on local energy, water and carbon balances in an Amazonian agricultural field, Global Change Biology, 10 (5), 895-907, 2003.
da Rocha, H.R., A.O. Manzi, O.M. Cabral, S.R. Saleska, S.D. Miller, M.L. Goulden, S.C. Wofsy, N. R.-Coupe, L.S. Borma, A.D. Nobre, G. Vourlitis, J.S. Nogueira, F.L. Cardoso, B. Kruijt, H. Freitas, C. von Randow, R.G. Aguiar, and J.F. Maia. 2009. Patterns of water and heat flux across a biome gradient from tropical forest to savanna in Brazil. Journal of Geophysical Research - Biogeosciences, 114 (G00B12), doi:10.1029/2007JG000640. Saleska, S.R., Rocha, H.R. da, Kruijt, B., Nobre, A.D., 2009. Ecosystem Carbon Fluxes and Amazonian Forest Metabolism, in: Amazonia and global change. American Geophysical Union, Washington DC. Restrepo-Coupe, N., Christoffersen, B., Rocha, H.R. da, Araujo, A.C. da, Borma, L.S., Cabral, O.M.R., Camargo, P.B. de, Cardoso, F.L., Costa, A.C.L. da, Fitzjarrald, D.R., Goulden, M.L., Hutyra, L.R., Kruijt, B., Maia, J.M.F., Malhi, Y.S., Manzi, A.O., Miller, S.D., Nobre, A.D., Randow, C. von, Sá, L.D. da A., Sakai, R.K., Tota, J., Wofsy, S.C., Zanchi, F.B., Saleska, S.R., submitted. Gross Ecosystem Productivity Seasonality in the Tropics: Issues Posed by the Absence of Co2 Profile Measurements at Eddy-Flux Systems. Agricultural and Forest Meteorology. Restrepo-Coupe, N., Rocha, H.R. da, Christoffersen, B., Araujo, A.C. da, Borma, L.S., Cabral, O.M.R., Camargo, P.B. de, Cardoso, F.L., Costa, A.C.L. da, Fitzjarrald, D.R., Goulden, M.L., Hutyra, L.R., Kruijt, B., Maia, J.M.F., Malhi, Y.S., Manzi, A.O., Miller, S.D., Nobre, A.D., Randow, C. von, Sá, L.D. da A., Sakai, R.K., Tota, J., Wofsy, S.C., Zanchi, F.B., Saleska, S.R., submitted. What drives the seasonality of productivity across the Amazon basin? 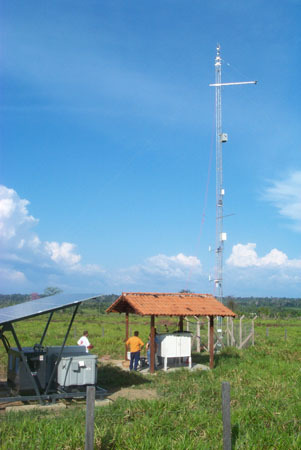 A cross-site analysis of eddy flux tower measurements from the Brasil flux network. Agricultural and Forest Meteorology. Saleska, S.R., Didan, K., Huete, A.R., da Rocha, H.R., 2007. Amazon Forests Green-Up During 2005 Drought. Science 318, 612.